In the construction industry, the successful and long-term implementation of quality programs has been hampered by the fact that, unlike safety, there is no single measure of quality that can be used to compare oneself to other companies. Past attempts at tracking quality within construction have inevitably failed due to the fact that quality is subjective and what one person may accept as high quality may be considered by another to be insufficient. In addition, the past attempts have approached measuring quality using indicators of quality, such as the number of punch list items, the number of requests for information, or the number of callbacks for projects. The problem with using the "indicators of quality" approach is that it was impossible to determine what an acceptable level of quality was for a project, or in other words, what number of requests for information results in an indication of unsatisfactory quality? Complicating the indicators of quality approach is the fact that not all indicators are negative – for example, requests for information that resolve installation issues and improve the quality of the end result is a positive. Therefore, in order to go beyond the "indicators of quality" approach and measure quality metrics that are comparable across projects and companies, there are two fundamental categories of quality metrics: preventative and resultant. For a quality program to be successful, it is critical that a company implements preventative activities to proactively evaluate and ensure the implementation of quality on construction projects. Therefore, a robust Quality Program will track and report Preventative Quality Metrics – also termed Leading Indicator Quality Metrics by some companies. It has been found that simply reporting the status of Preventative Quality Metrics (e.g., the status of submittal reviews) is not effective in that there is no understanding or agreement on what is good or what is bad. Therefore, the best practice in reporting of Preventative Quality Metrics is that of “Exception Reporting”, where the report only includes those projects that have failed to meet pre-defined and agreed upon expectations (e.g., complete their site specific quality plan within a defined time period). Therefore, by reviewing the preventative activities of your Quality Program, a company’s leadership can assign reasonable expectations to each activity. Then, when a project does not achieve the expectation, it is recorded as an exception and reported to leadership for follow-through. A sample Preventative Quality Metric Exception Report is shown below. As you can see from the table, Division and Company Leadership can quickly see where they need to focus their attention to drive preventative quality on their projects. Also, while the example shows a Division Level Summary, the report can just as easily be at a Project Level, so that Division Leadership knows what specific projects are “In Exception”. To understand how to measure resultant quality in the construction industry, it is important to first agree that there are certain outcomes on a project that should not happen, and when they do, it is a clear indicator of a “poor quality process”. This concept is already the foundation of measuring our safety programs – any injury is unacceptable and indicates a failure of the overall “project safety process”. Therefore, by defining a new term “Quality Incidents” as those that are not acceptable on a project, it is possible to calculate a “Quality Incident Rate” for a project based upon the number of hours worked on the project. The primary benefit of this approach is that the terminology is understood by everyone in the construction industry due to it paralleling safety reporting for the past 30 years. In addition, the measurement focuses upon reducing the unwanted results, not a generic number of items with an unknown acceptable level. As with safety, there are less severe (recordable) and more severe (lost time) incidents, for Quality Incidents the range are from less severe (items that occur during construction), to more severe (items that result in a claim). Therefore, for quality, there is the Construction Quality Rate that measures the quality of during the construction of projects and there is a Claim/Latent Defect Rate that measures of the long-term impact of quality, typically after the construction of the project. Both of these rates are based on the reporting and categorization of a Quality Incident. What is a Quality Incident? In order to calculate a Project Incident Rate, we must first clearly define what a Quality Incident is. As introduced earlier, the basic premise of the approach being taken is that a Quality Incident is something that should not happen during or after construction of a project that has good quality. While the list could be very long, it is important to focus on the end results (e.g., an injury in the safety program). At the highest level, the project team should implement their project to avoid key risks and to deliver the desired level of quality in the end product. To accomplish this, the project team develops and agrees upon key activities and steps to be accomplished throughout the project. Therefore, a primary first step in defining a Quality Incident is to identify the broad categories of “unacceptable events” with respect to project quality. Through analysis of data, it has been found to be important to clearly identify and define the categories, though it is not as important what the specific categories are. A good approach in identifying the categories is to document results that indicate a lack of follow-through on implementing the project quality plan, or risk that was avoidable on the project during construction. Water Infiltration – a water event (weather, site, system) that resulted in effort to clean up or damage to existing construction. Missed Key Project Activity – any activity the project team committed to in their quality plan that they subsequently did not accomplish. Major Rework – any rework above a set cost (for example, $2,500) to any party - owner, designer, contractor or trade contractors; or any rework that impacts the project's critical path by one day or more. Failed Tests – any test that fails for which the project team had expected to pass. The value of a Quality Incident is not its reporting, but using the data from all reported Quality Incidents to understand risk and trends within a company and across companies. Therefore, there is key information which needs to be captured with each Quality Incident. Work Category – identify the scope of work with respect to the Quality Incident. Primary Cause of Quality Incident – identify what caused the Quality Incident, such as Workmanship, Coordination, Design, Inadequate Training, Manufacturing Defect, Plan/Shop Drawing Review, Shop Fabrication, Unknown Field Condition, etc. Cost of Quality Incident – estimated order of magnitude cost for the Owner, Designer Professionals, Trade Contractors and Contractor. Implications to Schedule – estimated order of magnitude impact to the schedule. It is essential that companies and the construction industry gain value from the reporting of Quality Incidents, otherwise it will be very challenging to maintain the effort and commitment required. This value comes from the analysis of the metadata from all Quality Incidents over several years to identify and react to key trends and risk areas. While many approaches have been tried, the most effective means of analyzing the data is to simply compare the aggregate cost and number of Quality Incidents by Work Category. The simplicity of this chart is that it allows one to visually see where the risk has been (Q4) and then create programs and training to address and eliminate the issues/risk. The goal is to drive the Q4’s down and to the left – making them Q1’s. 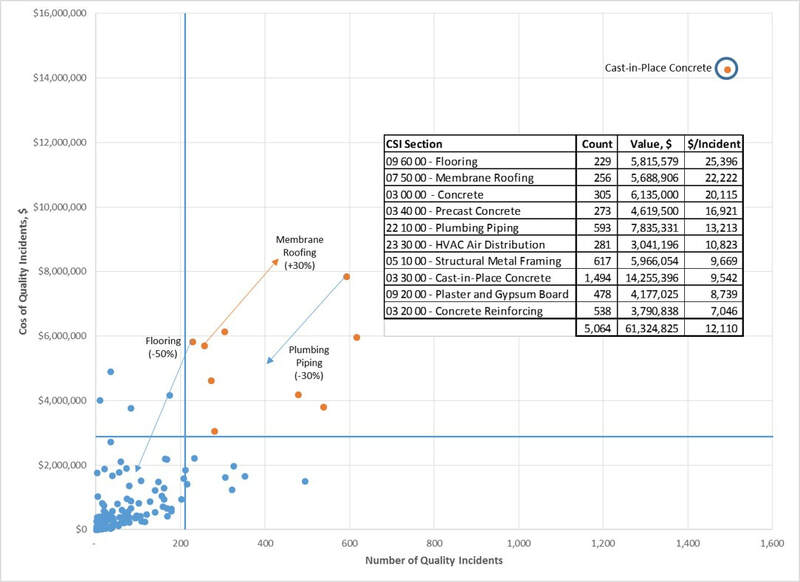 The CQEC Member Companies have been sharing their Quality Incident Data since 2003is can be seen in practice by looking at the change of Quality Incidents over a 12-month period for a group of CQEC member construction companies. The above chart represents a total of 14,397 reported Quality Incidents at a value of $152,538,502 occurring from 2003 through 2015. The trend arrows in the chart indicate where the indicated category is currently at versus overall average (i.e., flooring is no longer a Q4 for the group, but is now (2015) in the Q1 quadrant. ​The significant improvement in the Q4 Quality Incidents were due to CQEC Member Companies engaging together in dialogue regarding root causes and countermeasures and, in their companies, implementing training programs around flooring (concrete substrates and flooring products as a system), roofing and water issues on projects. In order to transition through the culture change, a company requires commitment and leadership to the change, along with clear messaging throughout the change to reinforce expectations as well as value to the individual and the company. The following are best practices to help a company through the Quality Incident Culture change. Leadership – the primary success factor to making Quality Incident Reporting part of the institutional culture is the engagement of senior leadership within the company. There must be a company champion (i.e. Company Quality Leader) that drives the vision, engagement, reporting, program improvements and training, But that alone is insufficient for success, the CEO, COO and Operational Leaders need to commit to the need bring quality to "front of mind", actively engaged in analysis of reporting and taking action to move forward. A High Rate is Good – as the Quality Incident Reporting gets started, it is essential that leadership and individuals recognize and promote that a high Quality Incident Rate is good, in that it represents projects being honest and open to reporting their issues. Any negative reaction to reporting will result in delays to changing the culture – address the issue, don’t berate the reporter. Exceptions are Bad – conversely, it needs to be clearly communicated that not reporting is bad. The best way to do this is through the Preventative Quality Metric Exception Report introduced earlier – by having leadership agree that any project not reporting a Quality Incident every “x months” is unacceptable and results in an exception to be addressed. Lessons Learned – the key to improvement is avoiding repeating past mistakes. Therefore, sharing of key and repetitive Quality Incidents from the company to all employees is critical. This could be through newsletters, on-going training, or formal knowledge sharing systems. Analysis Leads the Way – the last step in culture change is clearly communicating the value to leadership and employees. This is accomplished through analysis, program improvement and more analysis – use the Q4 concept introduced earlier. Ultimately, the more companies that transition through the Quality Incident Culture Change, the more information we will be able to share across companies and continuously improve our industry. Comparison can also be by work put in place (dollars) or other measure of effort. Recommend reporting Work Category by the primary CSI Specification Section impacted by the Quality Incident. The order of impact could be tracked by estimated dollar value and/or man-hours to evaluate and correct the Quality Incident. Approaches include comparison of costs, numbers, severity, timing of Quality Incident and project type.